In the wee hours of this morning, I fell asleep with a Bible pressing into my forehead. It was a Superhero Bible with a red and blue cover, with tabs inside to mark each book – so that it’s easier to find verses when you’re looking them up. The Bible belongs to my youngest son, and he had a bad dream last night. The most scared he’s ever been. He crawled in with us (the second time in as many weeks), and I prayed with him and cuddled up next to him, and then moved back over to his bed with him to do the same. Back in his room, we were finding it hard to go back to sleep. Every little noise seemed bigger and scarier than it actually was. So he asked if I’d read from his Superhero Bible. We’ve been reading through it together, slowly but surely, for at least a year now. Page by page, chapter by chapter, book by book. We’ve been reading the stories in the Word of God since he was born. But now we’re reading them as they are (with some parts skipped over for age-appropriateness!). And I smiled when he asked me to read, because I knew which story was next. I knew that we had just read about God’s provision for Elijah as ravens fed him by a river and a widow fed and housed him from the little she had. Next was Elijah’s battle against the false prophets. And rain after a long drought. And the defeat of the most wicked queen in the Bible. So yes, yes, yes, we can read Elijah. We didn’t quite make it through the whole story – it’s a LONG chapter and we usually break those down into 2 or 3 nights of reading. But my youngest knows the story, and he remembered that God is bigger than anything. And our hearts quieted down, and the noises of our old house faded into sleep, and there was just peace and safety and knowing God is on our side. This always makes all the difference, doesn’t it? I have struggled with nightmares most of my life. Ever since I was a little girl, bad dreams were often a part of my nightly routine. I had some amazing people pray for me before Joshua was on the scene. That seemed to calm them when they were at their worst – out in Calgary while I was at Rocky Mountain Bible College – I was 23 years old. The strapping young man I married told me to wake him whenever the nightmares came – he prayed for me and held me and I felt safe and loved. So when Elijah came to our bed last night, I told him about his daddy’s talent, and Josh prayed for him too. Then Elijah felt safe enough and loved enough to go back to his room – as long as I would go with him. I am becoming more and more aware that these times will come to an end as he just keeps getting older and older. Growing more and more into a young man – right before my eyes. So we lay under cozy blankets, we try to settle our hearts, we read about Elijah in the Bible, and I fall asleep with the Word of God pressed into my head on the pillow. I would fall asleep clutching my Bible to my chest. Not always comfortable if it was my hard-cover Bible! But absolutely always – this trick helped me every time. 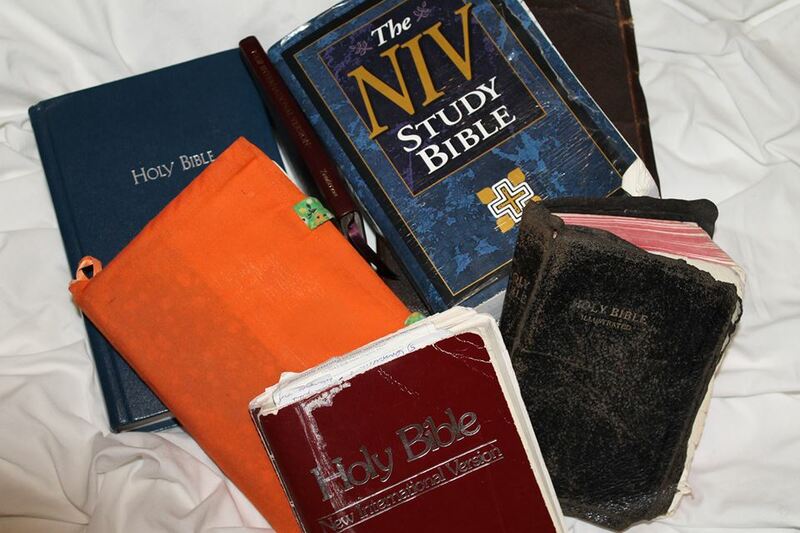 So the Bible stayed on the pillow as we drifted off to sleep. He’d tried my trick for a while, clutching the red and blue Superhero Bible to his chest. Then he’d laid it on the pillow beside him. And I woke up feeling like something was on my forehead, and I remembered the Bible, and I smiled. Even though the literal distance is so short. Sometimes all our Bible reading and all our knowledge about God just stays in our heads. Never makes it to our hearts. Where am I at with the journey? The Longest Journey… from head to heart. Where have I got you perched in my life right now, Lord? I can picture you waking up with a Bible stuck to your forehead 🙂 And yes, I remember those early nightmares, and how I prayed for peace for the little girl I loved. Elijah is very blessed to have such a loving family who trust in our heavenly Father, the one who protects and comforts all his children. Hi Anna thank you for this story! It was needed more than I New! God works in mysterious ways!